If you’re like me and enjoy crocheting necklaces to wear or give as gifts, you’re going to love my new crochet necklace pattern, Vine Necklace. This necklace works up in no time with size 3 crochet thread. You can use any colors you’d like, or make a bunch of them with different colors to go with lots of outfits! The necklace pattern is versatile, in that you can make all 3 strands of vines or only the flower strand for a simpler, even faster necklace! This pattern was originally published in 2013 as part of the CGOA Across the Board ebook. However, the copyright on this pattern has reverted back to me, so it’s now available for purchase by anyone! 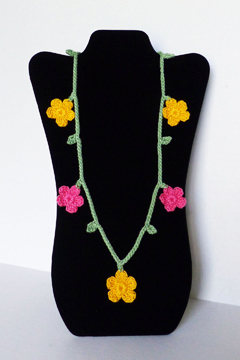 The sample necklace was made with size 3 Aunt Lydia’s Fashion crochet thread in #32 Candy Pink, #606 Goldenrod and #625 Sage. Either a size D/3 3.25 mm aluminum crochet hook or a size 0/3.25 mm steel crochet hook can be used. The pattern includes written instructions and photos of each section of the necklace. 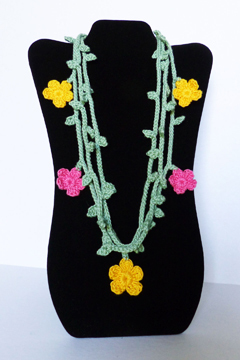 I hope you enjoy crocheting and wearing this necklace as much as I enjoyed designing it! 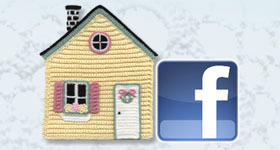 The pattern is available for $4.95 on the patterns page here. This entry was posted in Crochet jewelry, Crochet patterns and tagged crochet jewelry, crochet patterns, thread crochet. Bookmark the permalink.